Most companies with refrigeration equipment have environmental concerns. 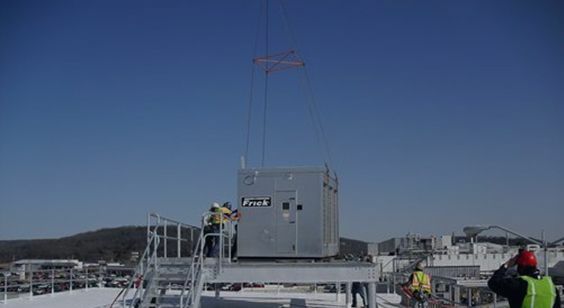 In fact, many businesses are removing equipment that uses CFC type refrigerants, and are changing to more eco-friendly anhydrous ammonia refrigeration systems. These systems have little impact on the environment, and they are also more efficient. However, it’s important to be aware of potential hazards when working with ammonia and have an effective action plan in place in case of leaks, or spills. If anhydrous ammonia refrigeration system develops a refrigerant leak, it can emit gas that is toxic. That said, people working near an anhydrous ammonia refrigeration system are not required to use protective clothing because these systems are sealed. Also, if leaks develop they are easily detected because of the fumes. Even though the refrigerant is non-flammable, it can be a fire or explosive hazard when mixed with air or oil. Ammonia may cause skin or respiratory irritation. The fumes are the most dangerous in areas without proper ventilation. To help companies develop their own action plans, OSHA has an online eToolyou can check out. McNeil Industrial specializes in anhydrous ammonia systems, and we are uniquely qualified to help you with OSHA compliance. We can give you a comprehensive process safety management program that includes everything you need. To find out if you must meet OSHA compliance rules and for info on a compliance audit, today: 800-728-6160.